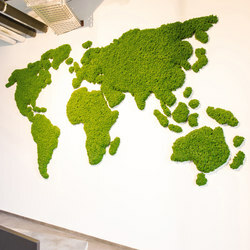 The green wall elements of the FREUND Moosmanufaktur have so many advantages for the room climate that one wonders why there are any offices without the sound-absorbing, dust-catching, climate-regulating and good-looking greenery systems made of real moss. 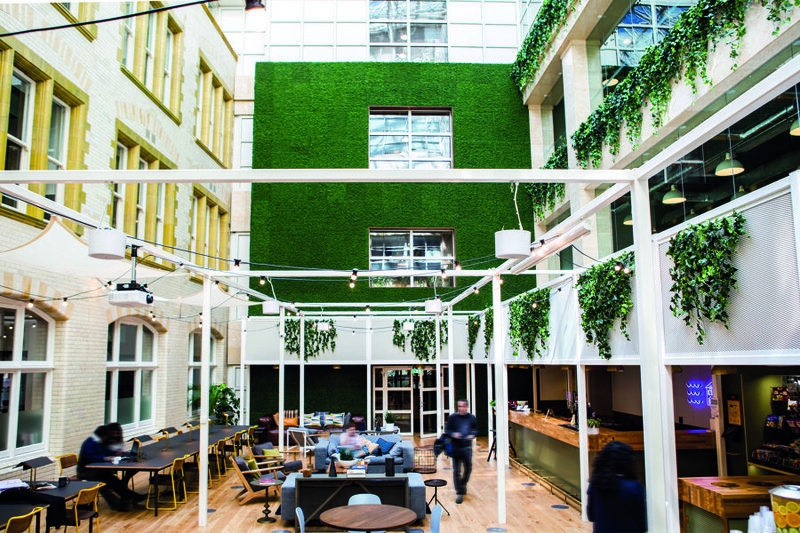 Ringing telephones, humming printers, chattering colleagues and beeping coffee makers can make office workers long for a tranquil refuge – with lush greenery, an invigorating scent and, above all, good air. For respite in this form, one no longer needs to leave the workplace, even in one’s daydreams. 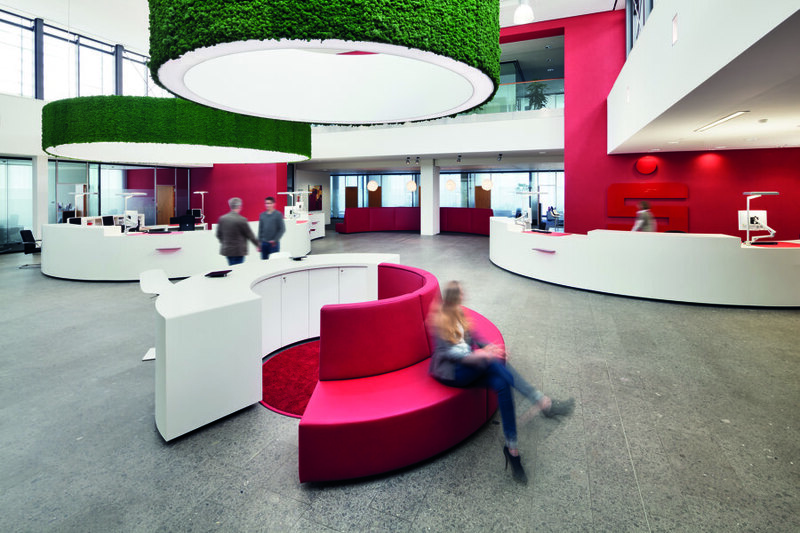 The fresh ideas of Freund GmbH bring it right into the office. 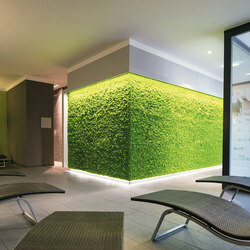 The Austrian ‘moss manufactory’ with a subsidiary in Berlin is dedicated to the natural at all levels. 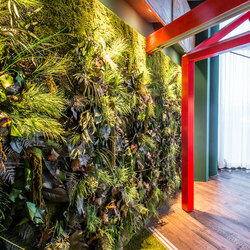 Its designs for wall and floor surfaces are created using moss gathered in the forest by hand, taking no more, of course, than can be naturally regenerated. The mosses are cleaned, dyed, preserved and, finally, applied to a substrate. A premium is placed on hand-crafted quality, each moss floret is worked manually in a process that does justice to the term ‘manufacture’ in its original sense. The refreshing green tones can enliven just about any expanse – from an extraordinary moss wall to an extravagant ‘moss picture’. 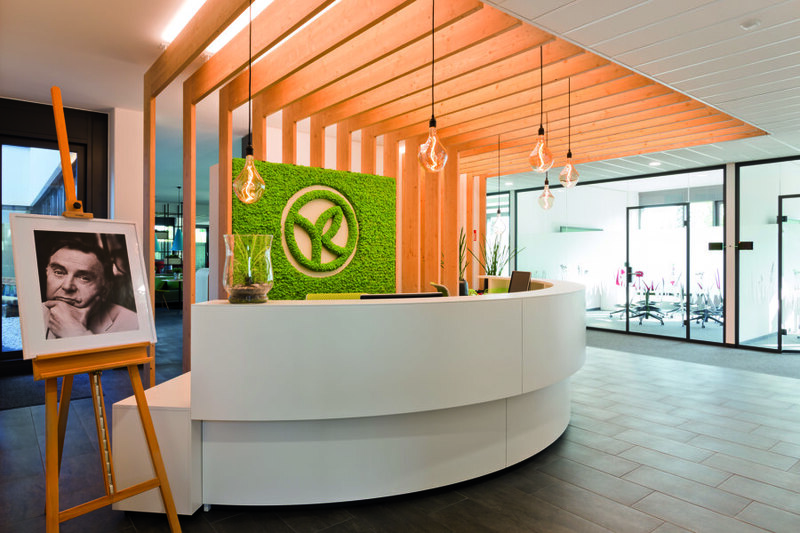 Freund GmbH took inspiration from Japanese Zen, in which moss connotes quiet, calm and permanence. 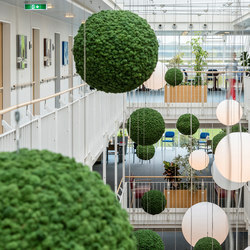 Eyes fatigued from staring at computer screens can find relief in the soft green hues that invite office employees to take a pleasant trip into nature, allowing them to catch their breath and indulge in at least a few moments of relaxation. Yet it isn’t just the eyes that get a break. 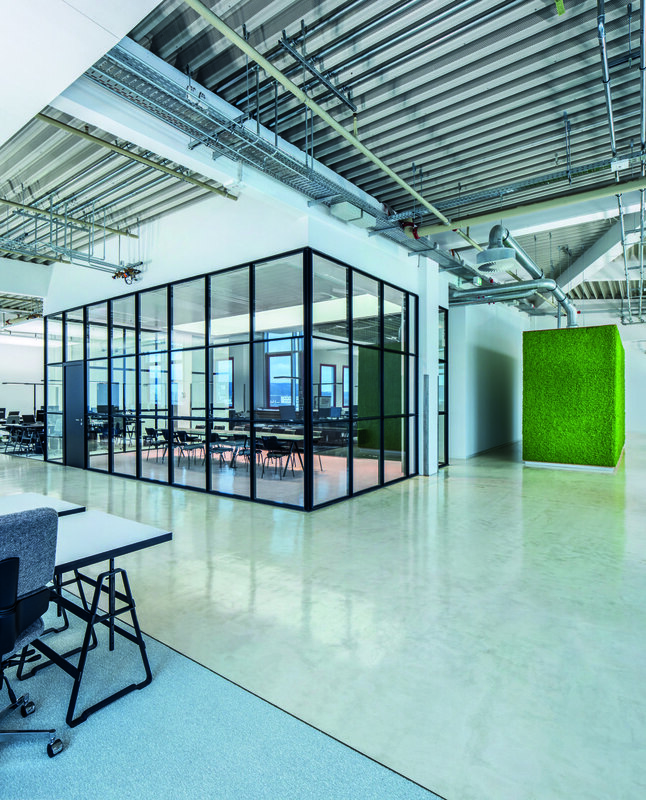 One’s sense of hearing, too, benefits from the living walls, which – especially in modern, open offices – significantly improve room acoustics. 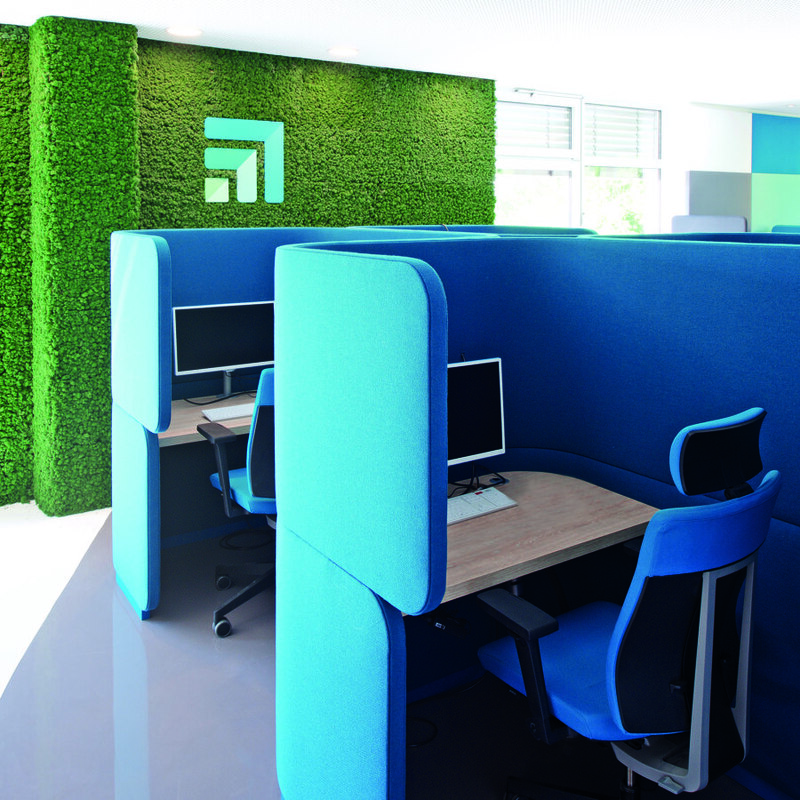 The live mosses absorb up to 90 per cent of ambient noise, an overall boon to the office environment. In practical terms, the three-dimensional ‘freshness treatment’ is extremely simple for the user. 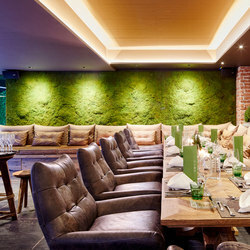 Whereas conventional indoor plants require constant attention, the moss is specially conserved to keep it in good condition without significant effort. The exclusive formula maintains the moss’s elasticity and reduces the needed care to a minimum. With the long life of the soft green moss thus ensured, even extended holiday absences are no problem. But the benefits don’t stop there. 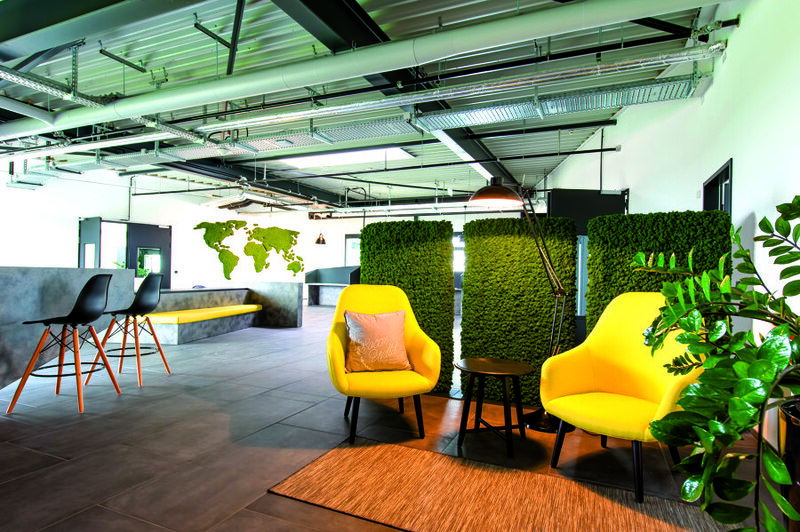 Thanks to their finely structured surface, moss walls from Freund GmbH in open-plan offices absorb not just sound, but also dust. 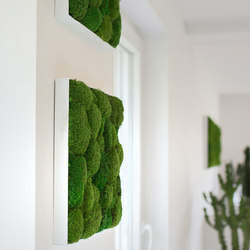 They, therefore, make ideal room dividers. 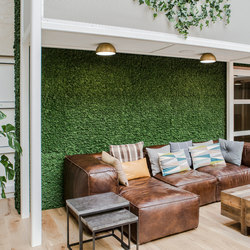 And they offer a further option for an improved office microclimate: automatic watering, which additionally helps maintain the mosses’ vitality and heightens their natural benefits to the surroundings. 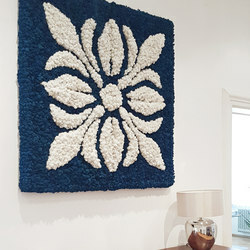 This raises the room humidity to up to 45 per cent and, as a result, cools the air by two to three degrees. During the colder months of the year, the continuous humidification enriches the dry air with moisture, and in the hot months, the indoor climate is enhanced by the constant temperature compensation. 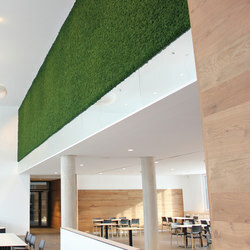 If desired, the green office acoustic elements can also be realised as a living plant wall. 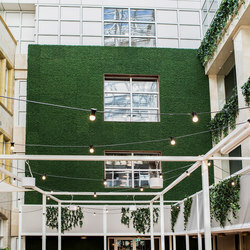 The positive effect of natural plants in enclosed spaces is undisputed, having been well established by scientific studies. With a restorative effect similar to that of a power nap, the plants promote concentration and productivity. 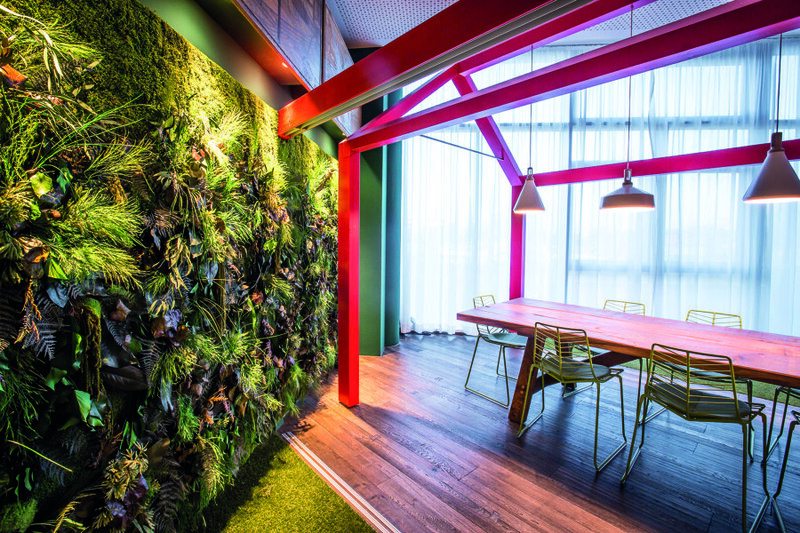 In short, green features in the workplace are salutary to the heart and the soul. 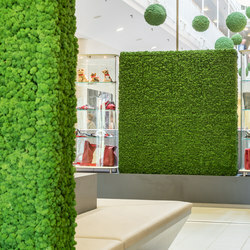 The mossy spatial elements can be designed in a variety of forms: they can be conceived in two or three dimensions, cover limited or extensive areas and set pointed accents or expansively occupy space. 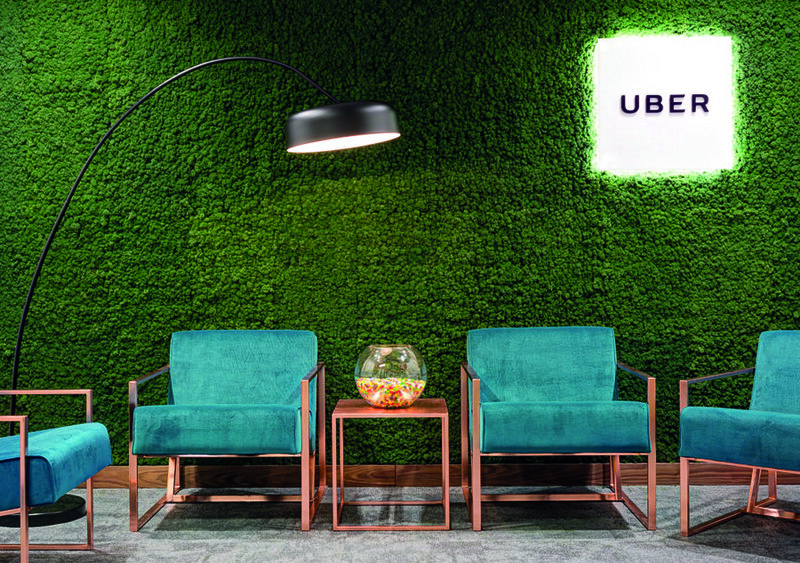 Attractive lettering and images and free-hanging spheres and cubes foster an improved interior atmosphere. The moss objects can be custom-made, in classic green or another colour of choice – for example, to highlight a firm’s corporate identity. Individual projects are developed according to the wishes of the architect or planner. 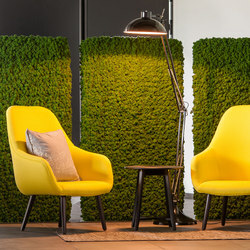 Along with the popular wall coverings, the moss elements are available as room dividers that are perfectly suited to creating different spatial zones, winning over users with their great flexibility. 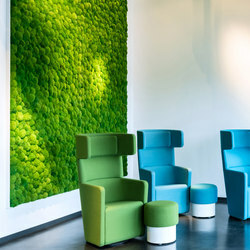 Whatever the chosen form, the green features are motivating and give people an all-around sense of comfort. The feel-good office is within easy reach.